Are you looking for West Bengal Primary TET 2018 Practice set? Don't worry, here is the best place for you. 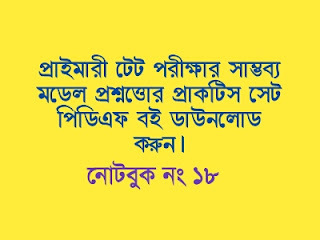 Primary TET is the most important for Bengal Job seekers. Most of the students waiting for this job. So before the start practice, you know about syllabus and question pattern. Study materials help you to better practice. You can download All Primary TET Study Materials from our website. We update regularly primary TET materials. 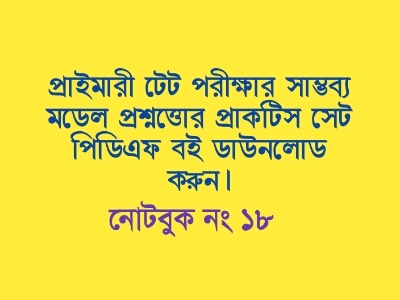 Today GK Solve share, West Bengal Primary TET Exam Model question practice set download link. Details of practice set and download link are given below. You can easily download this practice set pdf book just one click and free of cost. In this pdf, you can get 150 model question with answer key. This most important for West Bengal Primary TET Exam. So candidates are requested to download this notebook and start practice right now.